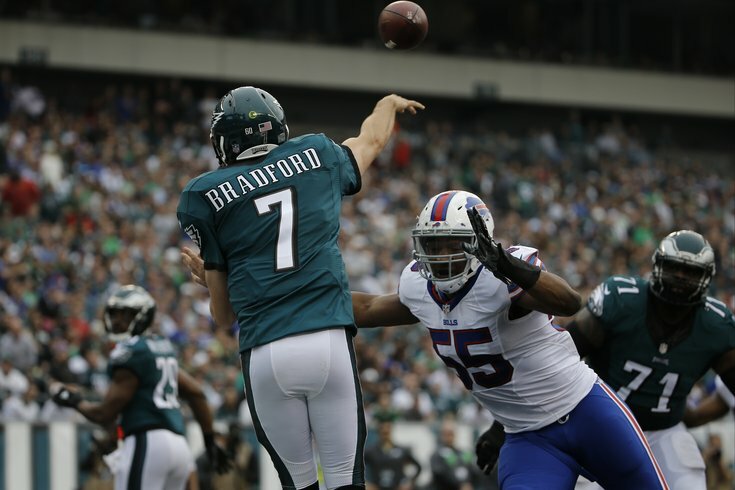 Eagles quarterback Sam Bradford gets a pass away against the Bills. The Philadelphia Eagles improved to 6-7 on the season -- and, more importantly, stayed tied with Washington atop the NFC East -- thanks to their 23-20 win over LeSean McCoy and the Buffalo Bills on Sunday. It wasn't necessarily pretty -- games against Rex Ryan's defenses typically aren't -- but it was a win nonetheless, and one Chip Kelly's team needed on the heels of their surprise upset of the Patriots a week earlier. Unlike after their OT win over the Cowboys in Week 9, when the Eagles squandered a chance to build some momentum by losing to Miami at home, they were able to keep their playoff hopes alive another week. The Bills held an advantage in almost every statistical category, but the Eagles managed to do something they've seemed almost incapable of doing for stretches earlier this season -- execute, especially when it mattered most. Here are five reasons -- despite Buffalo's statistical advantage -- why the Eagles came out on top. Bradford's stat line may not jump off the page at you, but the Eagles quarterback had another strong game Sunday against the Bills. He finished with a passer rating of 77.4, his lowest since Week 7 against the Panthers, and was 23-of-38 for 247 yards, one touchdown, and one interception. But that hardly tells the story of Bradford's day. He was on target throughout the game and showed good touch on a few passes, but what really stood out was something we hadn't seen recently from Bradford and the offense -- deep throws. On the first play of each of the Eagles' opening drives (both the first and third quarters), the Eagles took a shot downfield. Neither were completions -- their first play of the game was a 44-yard bomb to Riley Cooper that was overturned on replay -- but both were good throws by Bradford, and that's reassuring as the Eagles head down the stretch. Unfortunately, they don't have any great deep threats at receiver, unless rookie Nelson Agholor can come around. And speaking of Agholor, he was the recipient of Bradford's longest pass of the day, a 53-yard touchdown in the second quarter, the first of the wideout's young career. Bradford also looked poised in the pocket, and even stepped up and ran a few times. The only bad thing I'll say about Bradford -- he really did have a good game otherwise -- is about the sack he took late in the game. With the Eagles up three, he could have thrown it away on third down, but instead opted to take the sack. Since the Bills were out of timeouts, it would have been a smart play had it not been for the fact that the two-minute warning was up next. After the game, Bradford said it was a mental mistake on his part, but he wanted to make sure the clock reached the two-minute warning. He figured running around for an extra second or two would have guaranteed this. Not sure I'm buying that since the next play would have been a punt anyway and the clock would have stopped for the change of possession. Still, it was another solid outing from Bradford, and although he wasn't the only reason the Eagles beat the Bills, he certainly played a big role in their win. It was far from their two-touchdown performance in Week 13, but Dave Fipp's crew played another strong game Sunday. And, for the second straight week, played a key role in the victory. They got contributions from all over the place. But it all starts with punter Donnie Jones J'owns. 7 punts, 50.4 avg for Donnie Football today. One of Jones' seven punts traveled 63 yards. Another -- this one 52 yards -- was muffed by the Bills and recovered by Bryan Braman. Two plays later, Bradford connected with Agholor for the long touchdown. Jones also made his teammates better. He saved long snapper Jon Dorenbos after a bad snap on Caleb Sturgis' fourth-quarter field goal that ultimately decided the game. And speaking of Sturgis, he hit all three of his field goal attempts (45, 42, 30) and both extra points. He also consistently kicked the ball out of the end zone on kickoffs. Considering how the Caleb Sturgis Era began in Philly, it's nice to see him settle in as the season goes on. In the return game, Darren Sproles had another nice day, averaging 11.8 yards on punt return. He didn't break one this week, but he helped keep the Eagles on the winning side of the field position battle. Like I said, contributions everywhere. After Sammy Watkins beat Byron Maxwell and hauled in a 47-yard touchdown pass from Tyrod Taylor in the first quarter, it looked like it was going to be a big day for the second-year wideout. However, Watkins was kept in check the rest of the day -- his other four receptions totaled just 34 yards -- and only finished with five catches for 81 yards and the touchdown. Robert Woods actually had the better game; he finished with five catches for 106 yards. As for our old friend LeSean McCoy, he finished with 20 rushes for 74 yards and four catches for 35 yards. You can read more about his day here. And his night, here. Tyrod Taylor didn't have his best game, either. He threw his first interception since Week 4, and it couldn't have come at a worse time. His final pass of the day was picked off by Ed Reynolds -- which somewhat made up for the fact that he was late to give help on the Watkins TD -- and sealed the victory for the Eagles. And although he threw for 268 yards and ran for 53 more, Taylor's passer rating of 74.8 is his lowest of the season and certainly aided by the fact that he completed just 52.8 percent of his passes. Give some credit to the defense for this one. Part of the reason the Bills offense wasn't able to generate many big plays was Fletcher Cox. He was everywhere on Sunday. Some plays, it almost seemed as if he was in the backfield before the ball even hit Taylor's hand. He finished tied for a team-high eight tackles and also had the Eagles lone sack, but a lot of what he did against the Bills won't show up on the stat sheet. Play after play, Cox was exploding the middle of the Bills offensive line, and wreaking havoc for guard Richie Incognito. I don't think it can be oversold just how important he is to Billy Davis' defense. And after McCoy put his hands on the big defensive lineman earlier in the game, Cox got his revenge. The Bills are not a well-disciplined football team. They committed 15 penalties (for 101 yards), two of which turned crucial third and longs into much more manageable attempts. And it wasn't like the refs were calling every little thing a penalty. They had a bad game, sure, but if anything, they should have hit the Bills with at least another four or five penalties by my count. At least half of them would have been holding penalties on whomever was "attempting" to block Fletcher Cox all day. He wasn't lying. SelfRT @JimmyKempski Brandon Graham said the Bills OL holds a lot.